Our last day in Barcelona was bittersweet for us; we wanted to stay because it is such an amazing city with delicious food and great people. But we were also very excited to go to Madrid, so all we could do was to have the best day in Barcelona. We were actually supposed to go to Tarragona the day before but sadly we weren't able to make it. We decided to start the day by going to have breakfast at La Boqueria; although it was breakfast we decided to get the sampling tray of seafood accompanied by fresh juices. The seafood was cooked perfectly and was so fresh it was so delicious! I highly recommend it. We both really wanted to go to La Plaza de toros de Las Arenas, which is an old plaza de Toros that was turned into a shopping center; it was already on our list of places we wanted to visit. Our taxi driver from the airport when we first arrived also suggested not missing it so we knew we had to see it for ourselves. Once we arrived at La Plaza de toros de Las Arenas, it is so huge and there are so many stores that I am so glad that we went, there is a really good food court too. There are so many levels to explore, and to explain just how great it is inside there was a field trip from an art school drawing the architecture of the inside of the Plaza. Also if you go all the way to the top terrace there are more restaurants and a breathtaking view of the city! We were up there for quite sometime enjoying the cool wind; it was hard to walk away from the glorious view. When we were done looking at all the stores we headed out and started walking towards Museu Nacional d'Art de Catalunya. The walk there is amazing the Magic Fountain of Montjuïc is gorgeous, and from the very top of the stairs one can get another great view of the city. At the top there are little restaurants selling food and drinks to tourists, the last time that we visited Barcelona it was freezing and we bought hot chocolate and Churros. Let me just say they are delicious, and since in Spain Churros don't have cinnamon I am able to indulge. To our surprise they only make them on colder months, since it was a nice warm day they didn’t have any. I thought I wasn't going to be able to eat any, but the sweetest older man was so nice he made the hot chocolate and Churros just for us (everyone is so nice). While waiting for our food; we had a lovely conversation with an Australian retired couple that were traveling for a month and were not even done with their itinerary, they were so great to talk with and I really want to go to Australia now too. Once we got our food we were both able to enjoy our hot chocolate and Churros, which were just as delicious as I remember. We went to the very top were the museum is located and we listened to the musicians that were performing. There are always performers outside the museum since there is a small café outside and everyone relaxing and enjoying the day. But we didn’t go inside, because our next stop was Poble Espanyol! On our last visit to Barcelona we arrived so late from our tour of the day that we weren't able to go to the Poble Espanyol so we definitely could not miss it this time around. The Poble Espanyol is a museum, but it is unlike any other museum because it feels as if you’re in a different city. 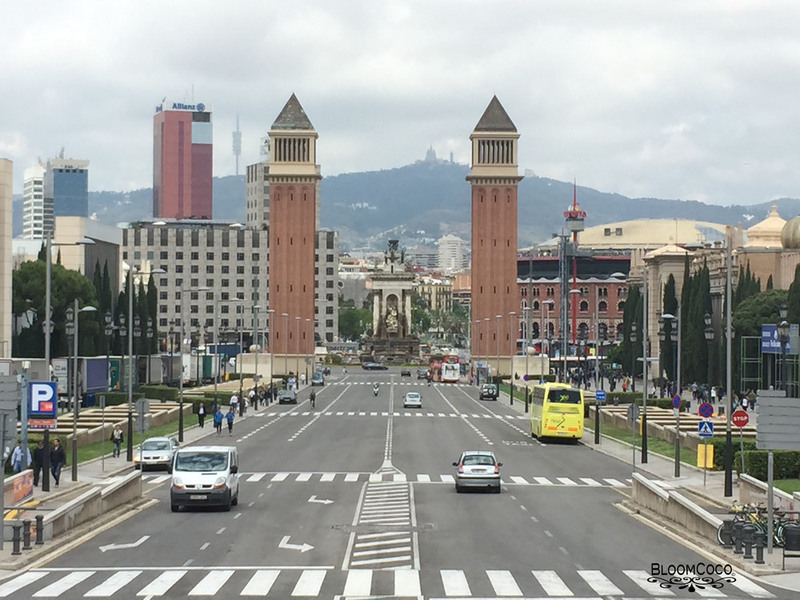 It was built in 1929, and it was actually supposed to be taken down after the International Exposition of Barcelona, but was kept because it was such a huge success. It has 117 buildings with little shops and restaurants and gardens as well. Each building is a representation of the fifteen autonomous communities of Spain, whenever I go somewhere I really enjoy seeing artisans and all of the work that they do. 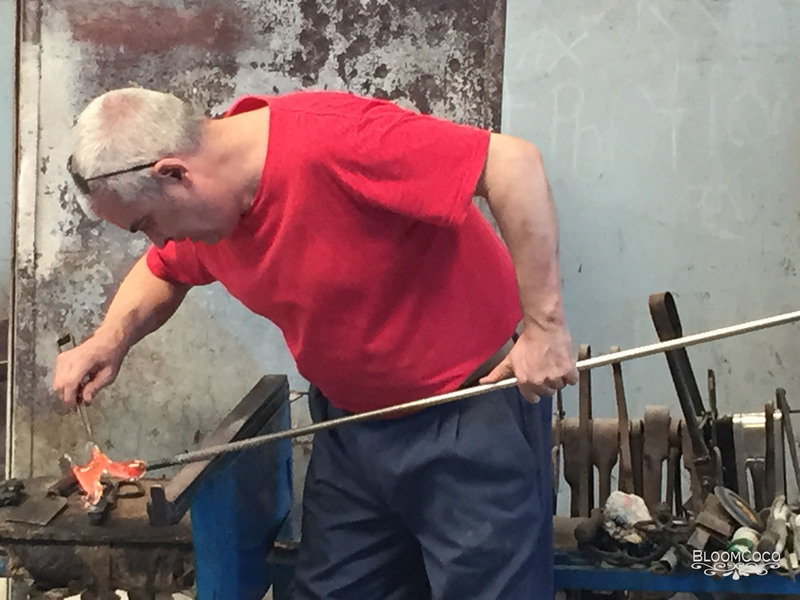 In Poble Espanyol there are more than 30 artisans, who work within the museum regularly such as the shop of blown glass, which I did not want to stop watching them work. It was such an incredible experience, because they are so talented and have such precision and they create beautiful artwork. There are a lot of artisan’s not just glass blowers; we also went into a lot of leather shops (one of them had the cutest dogs I wanted to bring back home with me) ceramics, masks, baskets, Spanish guitars, jewelry. There are workshops where you can see them work or they have shops where you can buy them directly from the artists, they are all very nice and if someone wants something customized then they will do it right there for you. Another highlight of Poble Espanyol is the museum Fran Daurel, It is a free museum and it is three levels it also included a sculpture garden. The museum has artwork that is a private collection of contemporary Spanish painters such as: Picasso, Dalí, Miró, Tàpies, Barceló, Guinovart and Amat, and more. They have everything from tapestries and drawings ceramics and sculptures. I always enjoy reading the information about each painting and learning more about each piece. There is no photography in the museum but they do have a lovely gift shop that one could go into at the end of the visit. There is so much to see at Poble Espanyol, we had such an amazing time exploring and seeing wonderful views, shops and buildings if you are ever in Barcelona, please go you will not be disappointed and on Sundays they do special events. Once we had seen everything, we were quite hungry so we walked to our favorite restaurant Pop In! It is a premium hamburger and hot dog restaurant and it is delicious!! We would go after the crazy food hours were done, because the line would be out the door. They have the best burgers and hotdogs and the fries are perfect just perfect. They even already knew us because we would go in so much and they were so nice always so friendly and very attentive if we would need anything. It was a perfect day and a perfect way to end our visit to Barcelona. Tip 3: If you buy your tickets online for Poble Espanyol they are cheaper then at the ticket booth. This is the Poble Espanyol website to see the special offers that they have and for more information.